Post-election events in Malaysia have been worrying, and are tarnishing the country’s image. In the immediate aftermath of Malaysia’s controversial elections, Prime Minister Najib Razak appeared conciliatory. He made all the right moves and said all the right words to an electorate divided by race, religion and wealth, and overwhelmed by a “Chinese tsunami”. His “One Malaysia” campaign – designed to show off Malaysia’s unity in diversity – was effectively shelved as Najib spoke of the need to reform entrenched race-based policies while urging calm within a sharply polarized society. A week ago he made headlines with a warning to his ruling United Malays National Organisation (UMNO) and its Barison Nasional (BN) coalition, in which he said that the party had to adopt a strategy to cope with changing times, adding “nothing is constant. Whether it is quick or not, change will happen." Yet Najib’s directives have proved as hollow as his victory in the May 5 poll was shallow. Amid the olive branches and well-rehearsed conviviality the government and police have embarked on a breathtaking crackdown on dissidence. President Christopher Leong said the Bar was appalled by charges against activists Adam Adli, Haris Ibrahim and Pakatan Rakyat (PR) politicians Tian Chua and Tamrin Ghafar, and the arrest of 18 people at a recent candlelight vigil in support of activists. "The recent arrests, prosecutions and confiscations by the authorities are manifestations of regressive and undemocratic conduct. The current environment is not reflective of a Government aspiring to achieve world-class democracy,” he said. "Rather than bringing about a society that is at ease with itself, it is instead creating an environment of grave concern. To promote greater democracy, the Government should welcome diversity of opinion, not close democratic space." The coordinated crackdown came after the worst performance ever by a Malaysian leader at an election since UMNO rose to power in the wake of independence in 1957. Opposition leader Anwar Ibrahim and his PR coalition won 53 percent of the vote but picked up just 89 seats in the 222-seat parliament. BN won 60 percent of the seats with just 47 percent of the vote. Results from 27-seats are still being contested against a backdrop of alleged cheating and fraud. 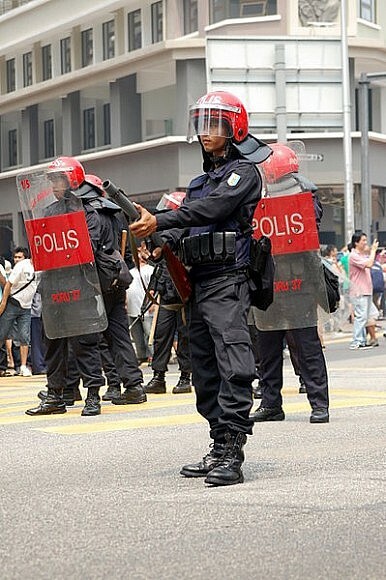 Thousands immediately protested, marching through the streets of Kuala Lumpur against a political system that constitutionally favors native Malays over Chinese, Indians and other ethnic groups, election irregularities — including use of indelible ink that washed off – and the perennial issue, corruption. The Election Commission was telling. A body that is supposed to be independent and an example of the separation of powers – and that is charged with the task of investigating electoral irregularities – went on the attack, challenging Anwar to withdraw from parliament if he refused to accept the results. That lack of impartiality will only galvanize opposition forces. However, it was gerrymandering in favor of rural Malays that saved Najib, UMNO and BN after Chinese voters deserted the BN coalition in droves. The arrests that followed were meanwhile reminiscent of the 1980s and 90s, when then Prime Minister Mahathir Mohammad ruled the country with a tough autocratic hand that his critics argue gave rise to the crony corruption prevalent today. "They are trying to frighten us into submission," said opposition politician Azmin Ali. "We must continue to stand up for our rights and our dignity." His sentiments were echoed by Teresa Kok, whose Democratic Action Party (DAP) attracted much of the Chinese vote. She said the arrests had simply made people angrier. Her party also blamed the government’s Home Ministry for deploying heavy-handed tactics. Another serious concern is the colorful imaginations at work. Utusan Malaysia, a newspaper with strong ties to UMNO, claimed the DAP had spent US$32 million a year for the past six years building-up a 200-strong Red Bean Army. Seasoned independent observers found the claims, backed by the New Straits Times, ridiculous. This correspondent has never heard of the entity, and nor has anybody else outside the Home Ministry’s circle of influence and papers claiming Anwar had used it “to incite hatred”. This eerie rhetoric is reminiscent of that which preceded the 1969 race riots, when 184 people were killed by rampaging mobs after Chinese voters deserted the ruling parties and UMNO performed badly. Those riots led to the declaration of a state of emergency and the initiation of race-based policies that exist to this day. The Asian Forum for Human Rights and Development (FORUM-ASIA) was among scores of NGOs and civil society groups upset by the government’s response to its own dismal performance, saying Najib had reneged on his promises of greater respect for human rights since assuming power in 2009. “We regret the charges against the organisers for having allegedly failed to serve the police with sufficient notice for the post-elections rallies. “The rallies have proceeded peacefully, and these charges appear to be only aimed at silencing political opposition and discouraging the legitimate exercise of the right to freedom of peaceful assembly in the country,” said Giyoun Kim, FORUM-ASIA’s Acting Executive Director. The response to the poll has been loud and clear. It has also provided a convenient diversion for Najib, who has serious issues elsewhere to deal with in a second term without a popular mandate. Two of his wife’s bodyguards are on death row for the murder of a beautiful model linked to Najib. The Prime Minister’s role in alleged corruption surrounding the purchase of two submarines from France will be scrutinized in a French court. And his government has failed to launch legal action against Philippine-based rebels who launched an insurgency in the eastern state of Sabah in March, resulting in the deaths of more than 70 people. Najib’s prospects are also not helped by recent Islamic demands to ban the use of the word “Allah” for “God” in Christian churches or by police tear-gassing Chinese hospitals during a rally by protestors demanding electoral reform. Najib’s future and his chances of surviving the wrath of his own party after such a dreadful electoral performance must be in doubt. The arrests and outrage that have followed will define not just his leadership but also his country, which now surely runs the risk of being tarnished as a latter-day apartheid state.